Odor Eliminator: Our general cleaner shampoo is crafted with Odortrol to break down odors at the molecular level. It leaves the coat smelling fresh. Gently cleans, conditions, and enriches the skin and the coat and is finished with a fresh and clean fragrance. Oatmeal: Crafted with natural colloidal oatmeal to calm dry, itchy and irritated skin. Replenishes and conditions the skin and coat leaving them soft and silky. Finished with a coconut fragrance. Hypo Allergenic: No colors or fragrances. Formulated for pets with allergies and sensitive skin. Tearless and can be safely used for frequent bathing without skin irritations. Skin Remedy: Gentle all natural shampoo, especially formulated to help solve skin problems. Exceptionally effective for controlling bacteria, fungus, yeast, ringworm, and flaky skin. Aids in cleaning and healing sores and wounds. Citrus Plus (Additional Cost): Embraces the natural benefits of d-Limenene to perfectly compliment your flea & tick regimen. Cuts through dirt and grease achieving a deep, gentle, clean finish. Soap free, citrus fragrance (kills fleas that are on the dog), and no residue. South Barks Blueberry Facial (Shampoo & Conditioner) (Additional Cost): Your doggie companion deserves the best. The blueberry facial cleans, and brightens your pet leaving a fresh blueberry scent. Made with blueberry extract, it can be used for facials or all over body for cleansing and optimal color enhancing. South Barks Blueberry Clove Conditioner (Additional Cost): Stimulates & Revitalizes the coat. Adds luster and softness with a pleasing scent. Furminator Shampoo & Conditioner (Additional Cost): Reduces shedding by releasing undercoat during the bathing process. Enriched with Omega 3 & 6 fatty acids, chamomile extract, aloe vera, calendula extract, and papaya leaf extract. Keto Hexidine Shampoo (Additional Cost): Combines Ketoconazol and Cholorhexidine Gluconate to help attack problems associated with bacteria, yeast, and fungi. Washes away microorganisms that can lead to skin conditions. Promotes healthy skin & Coat, and refreshes with a light mint fragrance. Pricing is based on breed, size, weight, and coat condition. Call or bring your dog by for estimate of cost. At Kelly’s Dazzle Dog we strive to not only make your animal happy while he’s here, but to make you as comfortable with the time he or she spends with us. We have 2 drop off times during the day. You can either drop your pet off in the morning between 8:30 and 10:00, or in the afternoon from 12:00 to 2:00. Our goal is to get your pets grooming finished and get them back to you as soon as possible. You can also set up your appointments as far in advance as you wish to. We suggest that you schedule appointments for the busy seasons as far in advance as possible so that we may insure that you don’t miss that special 4 of July or Christmas hair cut. 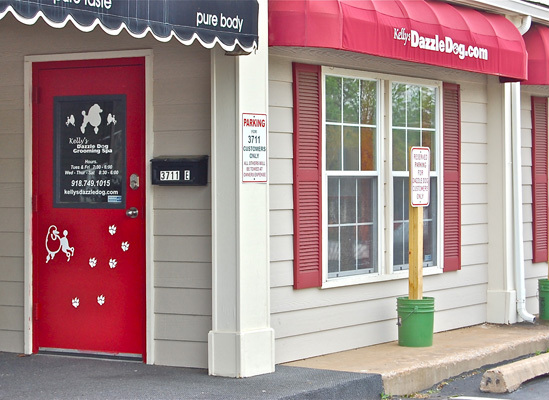 At Kelly’s Dazzle Dog we want to insure every client that this facility is as safe and pet friendly as possible. For a new client this means that when you are bringing your pet in for the first time we will need to see a copy of their vaccinations record from your veterinarian. The dates will be noted on their information sheet and checked in the following years not only for the safety of your animal but for the safety of others in the grooming shop as well.